Looking to buy a villa in Emirates Golf Club instead? Dubai is the best place to have a time of your life with your family members or friends, there is no denying that. The ambient streets of this celebrated city are buzzing with expats making memorable moments every second. According to some tourists, one lifetime is not enough to explore the full splendor of this city, which shows the magnificence of Dubai. The jaw-dropping skyscrapers are a product of the growth in the real estate sector. But they are not the only ones, the properties in Dubai are equally as impressive and house thousands of expats. A major focus of these developments has been on sports and one such example is the Emirates Golf Club community in Dubai. 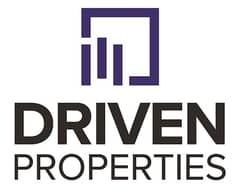 As the name suggests, the residential area is built around the famous golf course where so many players have started their professional careers. The properties in Emirates Golf Club perfectly comply with the theme and are a showcase of class and luxury, let’s see how. The elite location comprises of a total of 84 residential villas and townhouses that are very well-maintained. 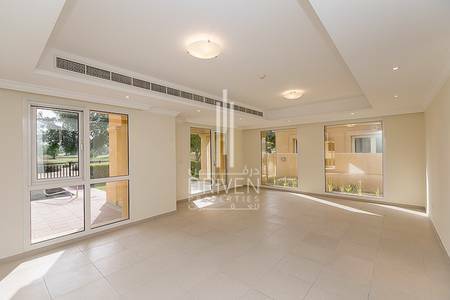 These 2-storey villas for rent in Emirates Golf Club are fully air-conditioned, ensure elegant use of space and promote the overall feel of golf. These villas have a very spacious garage and a backyard loaded with lush-green landmarks. The bedrooms have attached ensuite washrooms that are very classy. The kitchens are fully equipped and there is a very wide and cozy dining area, perfect to have a family dinner. All of the rooms are connected by an elegant and comfortable lounge. Currently, you can only choose from 4-bedroom villas for rent in Emirates Golf Club. 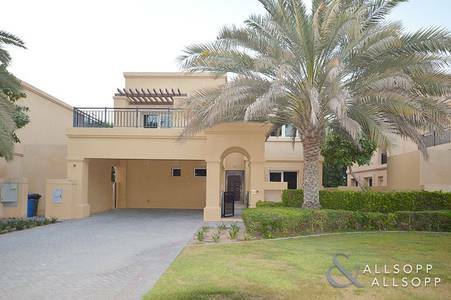 The Emirates Golf Club villas for rent have a price range that is well-suited to the luxury and lavishness of this residential community. You are getting everything you are paying for, which makes these villas such a good buy. 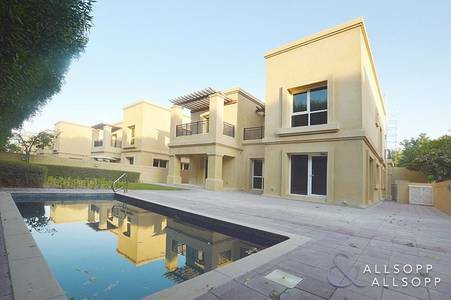 The renting range of these villas starts at around AED 280,000 and touches AED 335,000 per year at the other end. 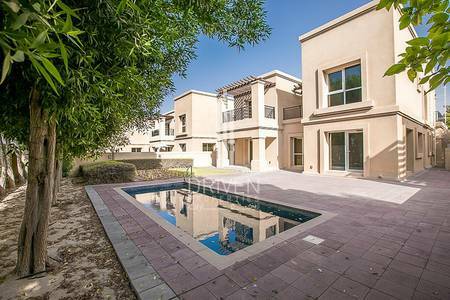 You can go for 4-bedroom villas for rent in Emirates Golf Club and get a nice place for your family. However, you must be willing to pay around AED 280,000 to AED 335,000 per year. Often the word golf is associated with luxury and that’s the basic concept of this residential area. 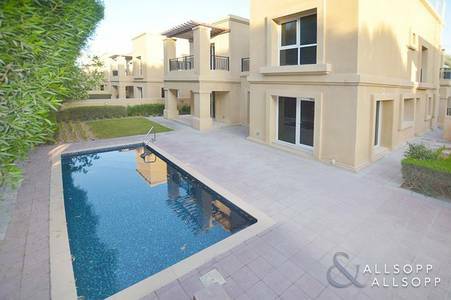 The rental villas in Emirates Golf club are within walking distance from the golf academy, world-class hotels and restaurants, glorious landscapes, and other recreational areas. Amazing temperature-controlled swimming pools, spas, gymnasiums, golf courses, tennis courts, lavish supermarkets, malls, healthcare clinics, fitness centers, and cafes are some of the amenities of this place. The villas are centrally air-conditioned, have three types of dining options and round-the-clock security available at the gates. The property is well connected to other areas of the city as well. By becoming a resident of this esteemed community, you will be qualified for a Club Membership of the Emirates Golf Club and can avail the facility of the gymnasium and other recreational areas. The rates will differ depending upon the luxuries. The Preferential Residents Golf Memberships are also available, which can provide you access to tennis courts, squash courts, and other amenities. This golf club is the very first of its kind in the Middle East, and top-of-the-line events happen here. The Dubai Desert Classic is the flagship event of this golf club that provides so much exposure and fun. For comparing with other residential areas, check out villas in The Lakes. I am looking for Villas to rent in Emirates Golf Club, Dubai, UAE. Please let me know about any suitable properties you have. Thank you.